You have to know what you want out of the social media marketing game. Write it down, and tie each goal back to your larger business picture. Put it on your wall, and every time you feel misguided about why you’re doing this, go back and look at it. Think long term, and build your “virtual Fort Knox” over time (vs. having a short term, transactional effect). At the beginning of this guide, I recommended that you choose one of the following reasons to use social media. For whichever one you choose, decide on how you’ll measure success for it. For example, if you were to choose “Build Community,” one way you might measure success would be how many comments you received at your blog posts or on your Facebook page. 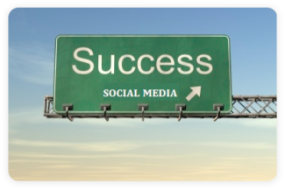 Be keenly aware of what “success definition” you’re using for the intentions you have for your social media efforts. If you don’t understand what success means to you in terms of Social Media Marketing, there’s no way to measure what you’ve achieved or where you need to improve. And it’s awfully hard to prove your success if you don’t know what you were aiming for in the first place. If you’re in business, you’re planning and outlining goals for every aspect – Awareness, Community Building, Service Opportunities, Collaboration Opportunities, Sales Opportunities (eventually). Assess your current state of affairs. If your business is brand new, try taking the pulse of the people (or businesses) that are where you seek to be, as well as setting realistic but challenging goals you can measure against later. Who exactly are you trying to influence with your social media efforts? What do those people look like? This is all part of the defining process. Where are people in terms of their relationship with you or the brand you’re portraying today? Nothing – People who have no relationship with you. There is nothing there. They don’t know you exist. Aware, With No Action – People who are aware of you, or your products and services or business opportunity, but have never taken action. Single Action – There are some people who have taken a single action. They’ve made a single purchase from you. Repeat/Enthusiasts – You have repeat purchasers and enthusiasts. Pick up to two of these (above) and make sure they’re adjacent, and that’s where you’re going to focus your efforts. The next step is to determine who your audience is from a demographic perspective. Facebook is great for this. Write out a thorough definition for all of these questions. This came at a good time. I’ve been having some trouble focusing on the next steps. It’s important to have an idea of what “success” looks like and it is going to be different for everyone.